Making sure that emergency medical service vehicles are up to the challenges of the first response field can be a challenging task. Remounts and upgrades must be performed to the highest industry standards to ensure that patients receive the best care and the most practical transportation solutions in emergency situations. Whether your organization is creating a mobile stroke unit or any other variety of emergency medical service vehicle, working with a trusted company can help you to achieve a greater degree of confidence in the quality of your upgrades and remounts. All vehicles licensed for travel on public streets and highways must meet the minimum requirements established by the National Highway Traffic Safety Administration as part of the Federal Motor Vehicle Safety Standards. The KKK-A-1822 specification set forth by the General Services Administration includes basic minimum parameters for warning signals, weight limits, electrical system setups and overall construction requirements. The National Fire Protection Association (NFPA) established the NFPA 1917 standard set that includes seat-belt monitoring systems, speed governors and carbon monoxide detectors. This standard builds on and expands the requirements listed in KKK-A-1822. The Ground Vehicle Standard does not currently offer direct recommendations for emergency medical service vehicles. Beginning in 2019, however, this standard is expected to provide guidance for remounts and upgrades to these types of vehicles. Virginia is the first state to enact standards and requirements for remounting emergency service vehicles. Using test results from the National Institute for Occupational Safety and Health, the National Institute of Standards and Technology and the Society of Automotive Engineers, Virginia has established one of the most demanding and rigorous standards for remounters and each used ambulance dealer in the state. Brackets and mounting fixtures like those offered by Technimount Systems can improve safety and ensure the greatest possible interconnectivity between medical equipment and the vehicles used for emergency medical transport. At Frazer, Ltd., we offer a wide range of remounting services for emergency medical service vehicles. We carry Technimount Systems products for easy configuration and installation of your mobile health equipment. Our team of knowledgeable and experienced experts will work with you to ensure that you receive the most cost-effective and practical solutions for all your remount requirements. Call us today at 1-888-372-9371 to request a quote or to schedule an appointment with us. 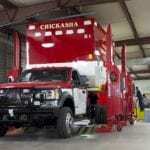 We look forward to serving your emergency medical service remount or replacement needs.